The market and the summer remain hot! Positive market conditions such as the low interest rate along with the diverse mix of properties and price points available have likely helped support this increase in interest in Victoria/Oak Bay real estate. Year to date in Oak Bay there have been 202 home sales. Two sales over $4 Million which is interesting. I think this is the most amount of sales I've seen over a million and it is only August; Between $1 - 2 Million so far there are 56 single family homes sold in Oak Bay and 11 sales from $2 Million plus. Between $600,000 - $800,000. show 83 sales to date. Below is a graph outlining the Victoria and Oak Bay Areas reported sales by price range from the Victoria Real Estate Board. If you would like to read more about the Victoria real estate market please read that page on my web site. I hope you have enjoyed the art displays throughout the Oak Bay Village and the painted pianos throughout Estevan Village. What a wonderful feeling walking with them around...it puts a smile on my face. I wish they could stay... Public Art List and Prices if this intersts you. If you are thinking about lisitng your home this fall please call today to discuss how to show your home well. The last two Oak Bay homes I listed sold within 1-3 days with multiple offers and ranging from $40,000 - $50,000 over asking price. I Look forward to hearing from you. Call, Email or Tweet! 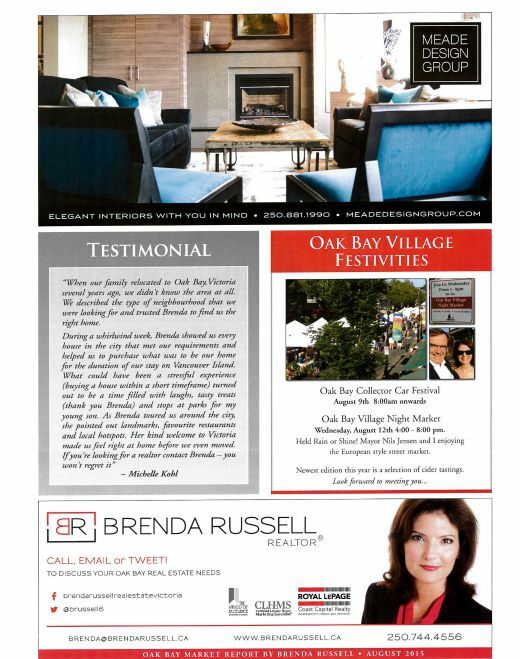 To discuss your Oak Bay Real Estate Needs and stay tuned for more updates.